Workers at the Nestlé/Lotte joint venture went on strike on 13 November after the company refused to accept a Supreme Court decision from December 2013 that declared that regular bonuses should be calculated as part of ordinary wages. The decision was further formalized by a Corrective Order issued by the Ministry of Employment in October this year. Other TNC's have complied with the ruling. The union has repeatedly demanded implementation during six months of negotiations to renew the collective agreement. The Company response to the union's claims has been threats to import product from Thailand and Vietnam and to hire new workers on fixed term temporary contracts. 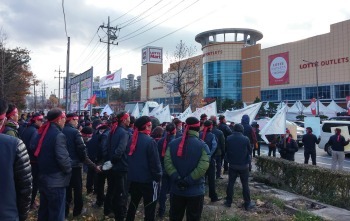 The workers marched to a Lotte Mart after denouncing the company's anti-union policy at a rally at the Cheongju plant and have called on the company to comply with the law and resume bargaining in good faith. Nestlé Korea, which manufactures Nescafé and other soluble beverages and petcare products, formed a joint venture (LOTTE-Nestlé Korea) with the food, retail and services conglomerate Lotte Group earlier this year.